Join the Education Department at Mexic-Arte Museum for Family Day with YLA 23 artist, Evelyn Contreras. 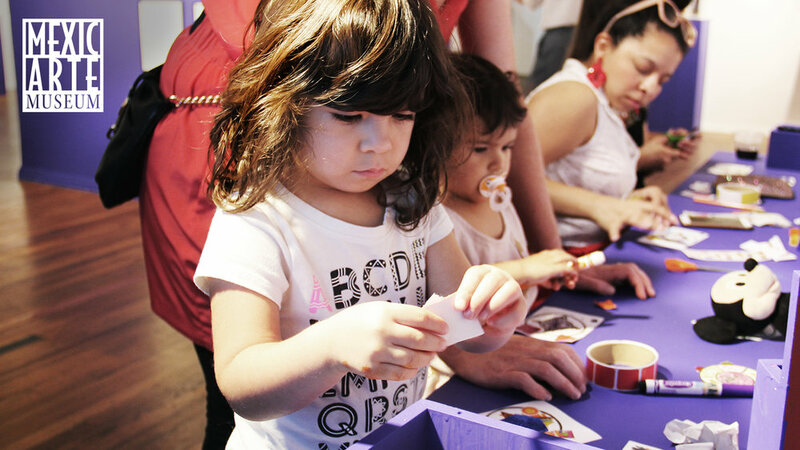 Visitors are invited to a Family Day workshop where they will explore pop-up book techniques and basic wire-circuiting. Come learn about Contreras' artist techniques and take home your very own pop-up card with an embedded UV light to illuminate your fabulous neon art! With the current immigration issues unfolding in the border region, the Museum will be accepting donations to assist families who are seeking asylum. Proceeds from the day will benefit the CARA Family Detention Pro Bono Project, who works to provide detained families with services and legal representation in Texas. Evelyn Contreras is a Southern California native. She received her B.F.A in Printmaking at CSU Long Beach and is a current MFA candidate at the University of Texas at Austin. Evelyn’s current work deals with manual and digital methodologies to create a cinematic and surreal experience through color, light, and form.